Sharks rarely attack humans and death by shark is even rarer, but victims don't often walk away unscathed. While every "I was attacked by a shark" story should impress your friends and family, some survival tales are just plain insane. The following stories and their aftermaths sound like pure fiction, but fiction probably wouldn't get this creative. When Todd Endris was attacked by a great white shark on August 28, 2007, near Marina State Park in California, he almost certainly should have died. The shark actually attacked him three times. The first attack didn't do much damage, but the second skinned his back open like, as he explained to Today, "a banana peel." With the third attack, the shark tried to eat his still-attached leg. All in all, Endris lost almost half his blood, and the shark probably would've taken the other half, too, if not for Endris' adorable, unlikely saviors: dolphins. After that third attack, a group of dolphins arrived and formed a ring around Endris, keeping the shark away (though it probably could've picked off a dolphin if it really wanted). Thanks to this distraction, Endris was able to ride a wave to shore, where lifeguards and a friend were somehow able to save his life. Just six weeks later, he was back in the water, seeking to conquer his fears by surfing in the same park where the shark nearly tore him to bits. He sadly passed away after a September 2016 car crash, but he harbored no grudge against his shark attacker, saying, "We're in his realm, not the other way around." Dangerous realm! It's important to have your priorities straight. Just look at James Grant, who was attacked by a shark, decided he wanted a beer, weighed hospital versus pub, and chose pub. Yep, as reported by The Guardian, in January 2014, Grant was spearfishing in New Zealand when a shark (likely a sevengill) attacked him. It latched onto Grant's leg, and he realized, in his own words, "Bugger, now I have to try and get this thing off my leg." You know you're tough when a shark trying to eat your leg is about as annoying as a housefly. He stabbed the shark with his knife until it let go and ran away. Grant then left the water, removed his wetsuit, and discovered multiple bites on his leg. Since he was a doctoral student, he stitched himself up and then decided it was time for a cold one. So he and his friends hit the nearby Colac Bay Tavern for a drink. Once he was done, he headed to the hospital he worked at, where not-drinking and presumably not-so-cavalier doctors did a better job of stitching him up. Grant's only regret? He didn't finish the shark off when he had the chance. As he put it, "It would have been great if I had killed it because there was a fishing competition on at the Colac Bay Tavern." See? Priorities. At age 13, Bethany Hamilton was already a rising surfing star. She'd been surfing competitively since age 8, had a sponsor by 9, and took second place in the National Scholastic Surfing Association national championships at 13. And then a shark tried to ruin all her fun. On October 31, 2003, Hamilton was surfing with a friend when a 14-foot tiger shark appeared, grabbed her arm, shook it until it tore clean off, then left with its dinner. Hamilton, despite being 13 and minus half her arms, rather calmly informed her friend, "I've just been attacked by a shark." They then paddled back to shore, where Hamilton's friend's father used a surf leash as a tourniquet to help save her life. While you'd understand if she never approached water again in her life, Hamilton never once considered quitting. Just a month later, she was back surfing, returned to the NSSA national championships in 2004, and won herself an ESPY for best comeback athlete. She's since competed in many competitions, winning or placing in most of them, and has no plans to stop anytime soon. Unfortunately, as she explained to The Guardian, many people — including her fans — don't know she's a championship-level surfer. They know her mostly for the shark attack. So she's currently producing the documentary Surfs Like A Girl to show the world she's more than just a shark survivor and always has been. Henry Bource was a rock star who played saxophone with '60s rock group The Thunderbirds. He was also a total badass who, as told by The Standard, not only survived a shark attack but insisted on video footage for all to see. On November 29, 1964, Bource was filming an underwater documentary around Lady Julia Percy Island, near Australia, when a great white shark attacked him. Bource did all he could to kick the giant fish off, but he still lost his left leg below the knee. Rather than forget about his documentary like probably anybody else in the world would, Bource told his crew to keep filming the aftermath. He even made sure they got footage of his leg, floating helplessly in the water since apparently the shark decided it tasted terrible. Bource recovered quickly, returning to the water just six weeks later — plus, he finished his documentary. He used the footage of his mutilation plus some dramatization to finish off Savage Shadows. Oh, and just three weeks after the attack, he was back rocking with The Thunderbirds. Knowing all that, it's not too surprising that, when reminiscing about the day he almost lost his life to a shark, Bource summed it up with, "Nearly spoiled my day, it did." For some people, a shark attack is just part of the 9-to-5. Nicole Moore came about as close to death as any survivor could. As recounted by Reader's Digest, on January 31, 2011, Moore was chilling at a Cancun beach when she bumped into a bull shark that tore her to shreds. It grabbed her left leg and took a gigantic chunk out of it like she was an apple. It also bit hard into her left arm — although she punched the shark and made it go away, her arm was destroyed. More importantly, her body was destroyed; the wounds were so grievous she could barely breathe, and each heartbeat sent a stream of blood shooting out the giant hole in her leg. It took a nearby hospital eight hours just to pump enough blood in Moore to keep her heart beating. The bites were so deep that Dr. Andrew Fagan, who later operated on her in her hometown of Toronto, noted bite marks on her bones. Amazingly, she persevered. Though there was no saving her arm, doctors successfully attached tissue from her right leg around the wound on her left. Two months after the attack, Moore was recovering at home. She eventually went back to work as a nurse, started running intense races like the Warrior Dash, and just to prove she's an equal-opportunity inspirer, she works with organizations that help shark attack survivors, plus ones that help conserve endangered sharks. After all, Moore knows it was nothing personal. Many fathers want their sons to grow up to be like them, but what happened with David Cozzan's son, Sebastian, was not what David had in mind. According to the Palm Beach Post, in March 2014, 9-year-old Sebastian was surfing at John D. MacArthur State Park in Palm Beach, Florida, when a spinner shark took note of him and pounced on his right foot. Despite kicking the shark in the mouth, Sebastian suffered enough damage to require 80 stitches. Oddly enough, in a case of the apple falling wayyyyy too close to the tree, Sebastian's father, David, told the Post that two decades before his son was shark-attacked, he too ran afoul of the angry beasts. He wasn't attacked just any old place, either — David was attacked by a shark at John D. MacArthur State Park, the same area where his son encountered one. David's shark even went after his foot, though it was the left one because life can't be too eerily coincidental. According to David, however, his son got it much worse; the elder Cozzan didn't need stitches. Thank goodness he still has ammo when bragging to his son about how much tougher people were in the "good old days." In 2006, Achmat Hassiem and his brother were assisting lifeguards in Cape Town, South Africa, by running survival drills. This involved Hassiem's brother lying in the water and pretending to be a drowning victim, but he was unaware that a definitely-not-a-drill 16-foot great white shark was approaching. Luckily, Achmat saw it and, knowing sharks typically are attracted to sound, started splashing the water so the shark would leave his brother alone. That plan worked, but the shark became very interested in eating Achmat. It grabbed him by the right leg and started pulling him underwater. Achmat used his other leg to kick the shark until it let go, but it still severed Achmat's leg below the knee. Luckily, a boat whisked him to shore once he reached the surface, and a quick trip to the hospital saved his life. He's since rebounded to do basically all the water things. 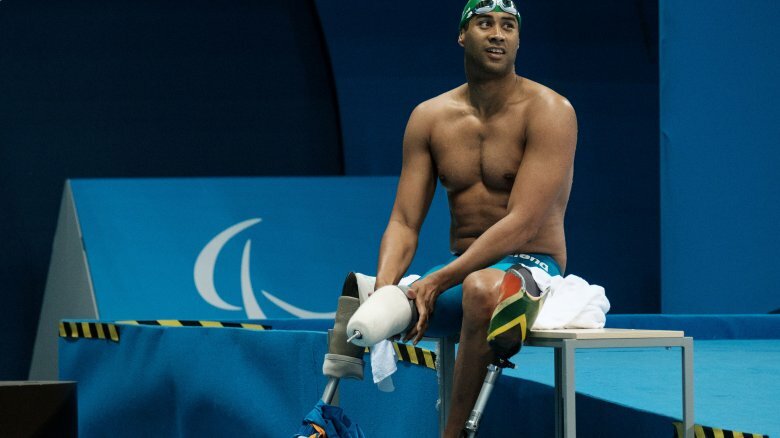 He started swimming competitively, reaching the 2008 Beijing Paralympic Games and winning gold in the 2012 London Paralympic Games. He actually thanks the shark for what it did, explaining to the BBC, "As a child I always wanted to represent South Africa, and the shark gave me the opportunity." In addition, he's also become a shark advocate, saying he now has "a sense that sharks are in trouble … and who better to speak up for sharks than a shark attack survivor?" Yes, he defends the very species that almost killed him, like if a tree fell on the Lorax's head and he kept speaking for them. Sharks are typically solo hunters; it's weird if they gang up on prey. Yet that's what happened to 15-year-old Shannon Ainslie. As he told The Surf Channel, in 2000 he was surfing in East London, South Africa. There, he attracted the attention of not one, but two 15-foot great white sharks. The first grabbed his hand and dragged him underwater, while the second attempted to bite Ainslie's head. Luckily, it missed, as the first shark quickly swim away with his prey. Then it just gave up and let him go, abandoning him to the lonely sea. Thankfully, a wave appeared, which Ainslie was able to ride back to shore. (He attributed it to a prayer he made while stranded in the water.) His fingers were dangling off his hand, but that's what stitches are for, right? Six weeks later, Ainslie was back surfing, albeit far from the scene of the attack and very nervously. He's since become more used to it and even admits that he doesn't fear sharks anymore. He used to, before the attack, but now that he's actually been a survivor, he finds he respects them a lot more. He's actually encountered sharks twice since and has felt no fear. Luckily, he's also felt no teeth. December 1963 brought one of the worst non-deadly shark attacks ever. 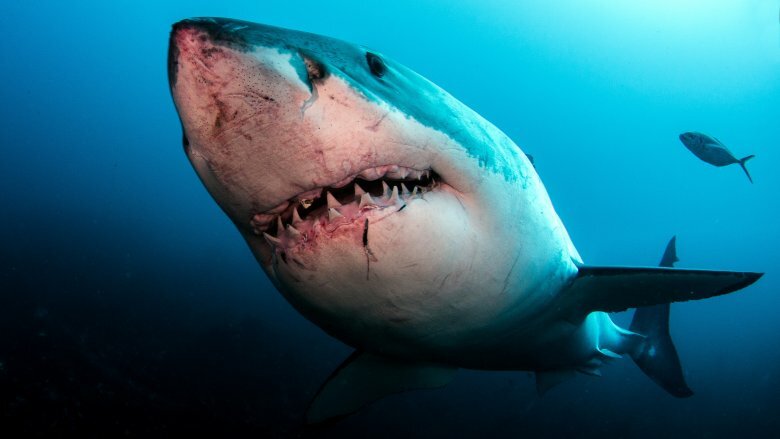 A diver named Rodney Fox was spearfishing when a great white shark dragged him 30 feet underwater. Even after Fox fought back and escaped, the shark followed him to the surface, attempting to drag him back down again. Luckily, the shark bit into Fox's fish float — when the line broke, the shark just kept moving. A boat then arrived to bring Fox to the hospital for much-needed medical treatment. The shark had shattered all his left-side ribs, tore so much flesh you could see his spleen (the video is gross), and bit his wrist so hard that a piece of tooth is still embedded there. Fox needed more than 360 stitches just to not fall apart. While he was too scared to continue diving after that, Fox didn't let it ruin his life. He became a conservationist and researcher, dedicated to helping people better understand sharks and how important they are to our planet. He even worked as a consultant on Jaws, although he's since come to regret it because, as he explained to the Dallas Observer, "We scared people, and that's not what I want to do. I'm here because sharks need our understanding and respect." Now he tours the world with the Planet Shark: Predator Or Prey program, seeking to end the stereotyping of sharks as mindless eating machines. Coming from someone almost eaten by one, that's a pretty respectable take. In 1997, Michael Coots lost his leg to a tiger shark attack. Mere weeks later, Michael Coots was back surfing. That's a man who loves the ocean and hates the idea of fear. According to News Corp Australia, Coots was surfing around Hawaii when a tiger shark appeared, decided it didn't like him, grabbed both of his legs, and started — as Coots put it — "[swinging him] back and forth like a dog would do with a toy." Afterwards, Coots punched it and it went away, but the damage had been done. Coots' right leg had been completely torn away. Not that that stopped him or anything — three weeks later, once all the stitches were out, Coots was surfing with a prosthetic leg to keep him balanced. He has no issues with sharks, regularly swimming around them and even taking selfies with them. He doesn't anticipate getting attacked again, since attacks are so unbelievably rare. Count him among those who've been attacked by a shark yet respect them completely. As he explained, "Sharks are not to be feared but are incredibly beautiful and an extremely important species for the health of our oceans." We're sure the sharks would agree wholeheartedly.